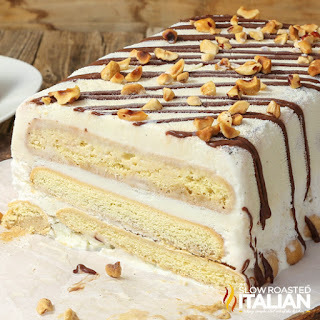 Tiramisu Ice Cream Cake is an unforgettable transformation of the classic Italian dessert into a simple recipe for a glorious ice cream cake unlike anything you have had before. It is rich, creamy, and absolutely special occasion worthy! We are so excited to be partnering with Medaglia d'Oro® to bring a fabulous Italian inspired recipe. Y'all know how much I love my coffee, my espresso, lattes and naturally.... tiramisu. 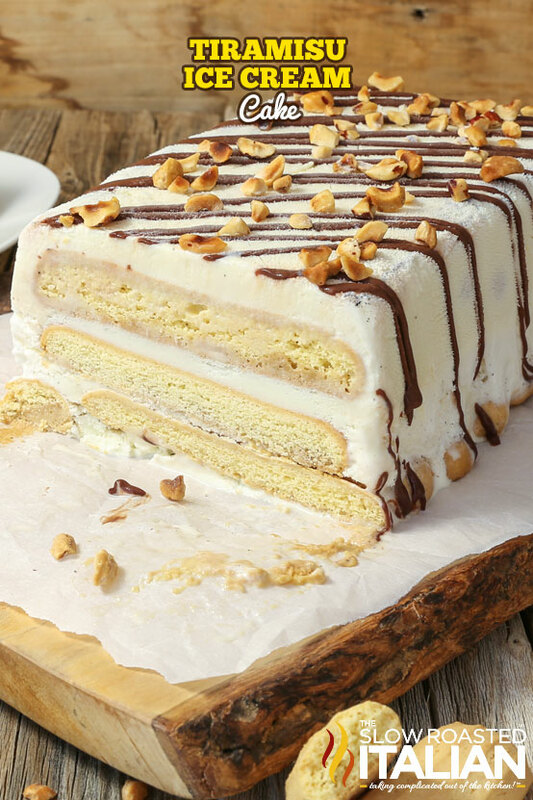 When I am brainstorming new recipes my mind often wanders off to my favorite Italian dessert. Of all the desserts out there I have to say I absolutely love love love tiramisu. I am sure you have noticed with all of the tiramisu recipes I have shared with you. Although, I have never shared my classic tiramisu, which I promise is coming this fall. But, it's summer and it's National Ice Cream Day. Horray!!! 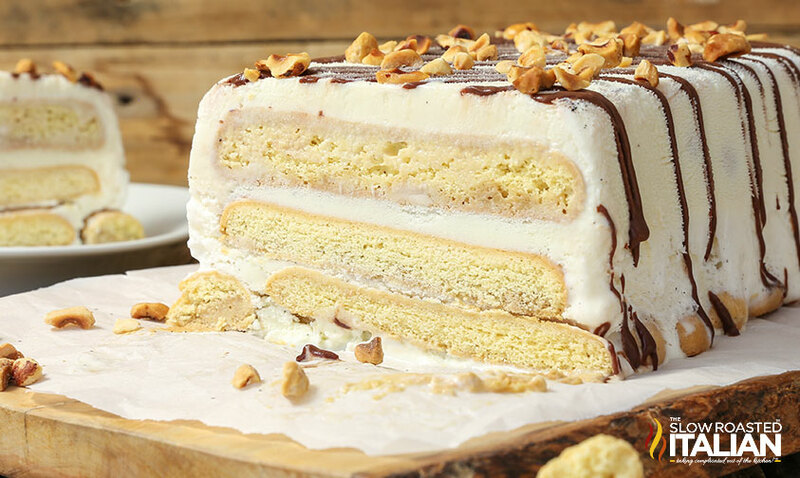 To celebrate this delicious occasion I pulled my love for tiramisu and ice cream together to create one glorious Italian inspired dessert: Tiramisu Ice Cream Cake! It is so easy you will be making it all year long. But, the flavor that is imparted into this cake is spectacular. It is absolutely divine! It makes me think of my childhood and the amazing Italian desserts that we enjoyed! The adults always had espresso or coffee with dessert and that is one of my favorite things about this tiramisu. 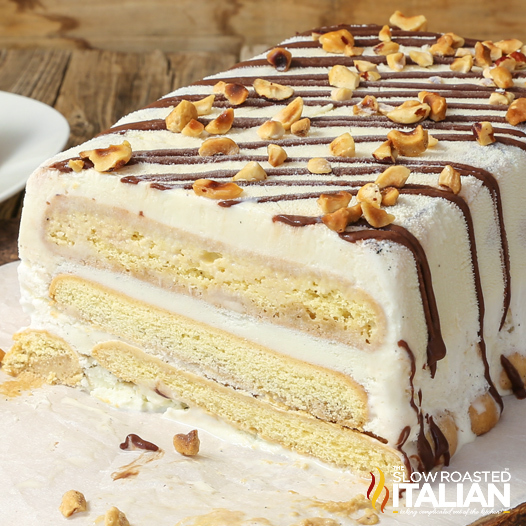 Ladyfingers are dipped in an unusually rich, aromatic, and delicious espresso. Medaglia d’Oro Espresso Coffee is a true Italian romance of fine flavors and bold, dark beauty. 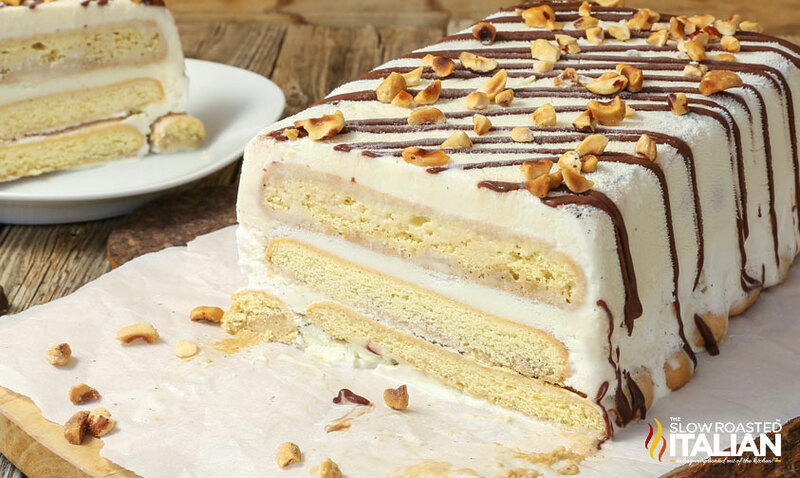 And it is absolutely the star ingredient in this tiramisu ice cream cake. The dipped ladyfingers are layered with rich vanilla ice cream. The flavors kind of remind me of my favorite affogatto (espresso over ice cream). It is drizzled with a scrumptious rich chocolate espresso ganache and sprinkled with hazelnuts to really take it over the top. This dessert is amazing and you are going to love it. 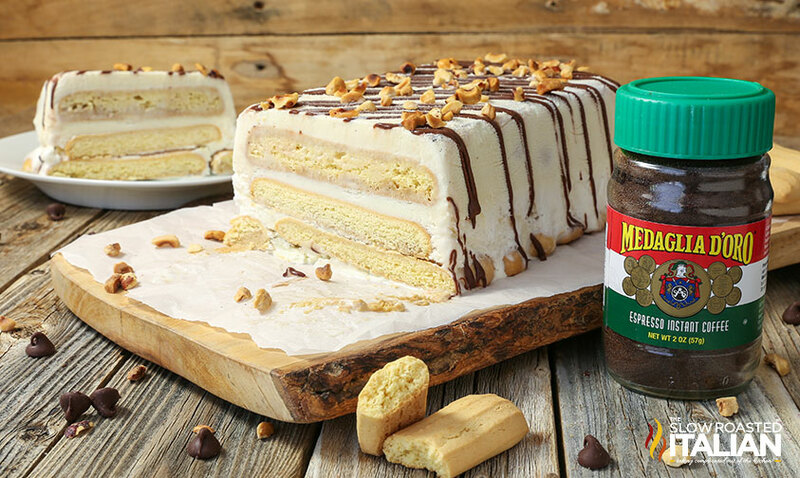 We couldn't stop devouring it and you will be eating it all year long! Can't get enough Medaglia d’Oro? Follow them on Facebook. For more information about Medaglia d’Oro and to find locations that sell the espresso near you visit them at JavaCabana. With love from our simple kitchen to yours. Want to see how you make this Tiramisu Ice Cream Cake? Watch the video! Add the ice cream to the bowls of a stand mixer and beat it until it is soft and spreadable, about 3 minutes. Or you can allow your ice cream to sit at room temperature for 15-20 minutes until softened. Double line a 9"x5" baking pan with plastic wrap, leaving enough hanging out the sides to wrap over the top. Combine espresso powder and water in a microwave safe measuring cup. Heat for 1-2 minutes until it is warmed. Reserve 1/2 tablespoon espresso to use in the ganache. Pour the remaining espresso into a shallow bowl. Scoop about 1/3 of the soft ice cream into the bottom of the pan. Use a spatula to smooth it into an even layer. Be careful the plastic wrap will move around a little. Dip the lady fingers into the espresso mixture one at a time and then quickly flip to soak both sides. Only keep it in the liquid for a second or so. Line the bottom of the baking pan with a row dipped lady fingers, about 8. Top with about 1/3 of the remaining softened ice cream, smooth into an even layer. Repeat the lady finger layer of cookies and ice cream again and then top with 1 final layer of lady fingers. Gently wiggle the top layer of cookies into the ice cream and cover with the excess plastic wrap. Place the cake in the freezer for 3 hours-overnight. Meanwhile; prepare the ganache topping by heating the cream, remaining 1/2 tablespoons espresso and corn syrup in a small microwave safe bowl or measuring cup until steaming. Be careful, as the cream may bubble over if it boils. Add the chocolate chips and whisk until the chocolate is smooth. Place in the refrigerator for 15 minutes to allow it to cool. Remove the cake from the freezer and invert it onto a serving tray. Use the excess plastic wrap to help lift it out of the pan. If it will not come out easily. Allow it to rest on the counter for a minute until it comes out easily. Remove the plastic wrap. Transfer the ganache to a quart size bag or piping bag. Drizzle the ganache over the cake making sure to leave space between the drizzle lines so the ganache will firm up. Quickly top with nuts before the ganache sets. Freeze until ganache is set or you are ready to eat. Enjoy! DONNA'S NOTES: If you do not run the ice cream in the stand mixer be sure to stir it up really well after it has softened or you will end up with big scoops of firmer ice cream and lots of melted ice cream which will make it harder to smooth it out. To easily cut the frozen cake, run a chefs knife under hot water and wipe it dry with a towel. Use the warm knife to easily slice through the cake. Copyright ©2017 The Slow Roasted Italian – All rights reserved. Can't get enough Medaglia d’Oro? Follow them on Facebook. For more information about Medaglia d’Oro and to find locations that sell the espresso near you visit them at MedagliadOro.com. Disclosure: This is a sponsored conversation written by me on behalf of Medaglia d’Oro. The opinions and text are all mine.